Veculim allows you to track and invoice Tow-In’s or Trade calls. 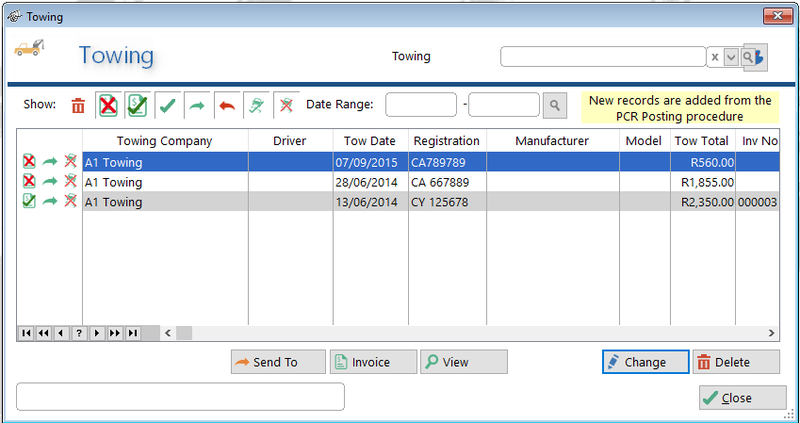 To view towing entries, simply access the Work menu and select the Towing icon. The Towing window will then be displayed. Tow-In = This is when You receive a vehicle from a Towing Company to be repaired. Most of the time these Towing records will be Invoiced out to the Insurance Company. 1. When you receive the vehicle for repair and realize there is something wrong with the vehicle that you can not fix in your shop and need to Tow it elsewhere to fix. This is for your Panelshop's account, no invoicing out. 2. Also when the Insurance Company lets you know there is a vehicle ready for repairs but you have to Tow it In to your shop, this will also be at own cost. This is done through the Capture GRVs&RFCs window as explained on Detail on Creating a Tow-In.